Sometimes words just get in the way. Especially when trying to describe the indescribable. In those cases it’s often best to let pictures deliver the message, even better if the pictures are moving and accompanied by a compelling soundtrack. So, without further introduction or preamble here is “Into the Valley of the Condor,” an exquisitely rendered new video short from Salmon Junkies filmmaker and photographer extraordinaire Columbus Leth chronicling his visit to — and by extension, the 2018 season — at Austral River Lodge in Chilean Patagonia. Unless you’ve been sleeping under a rock for the past year, you surely have seen the photos and heard the reports. 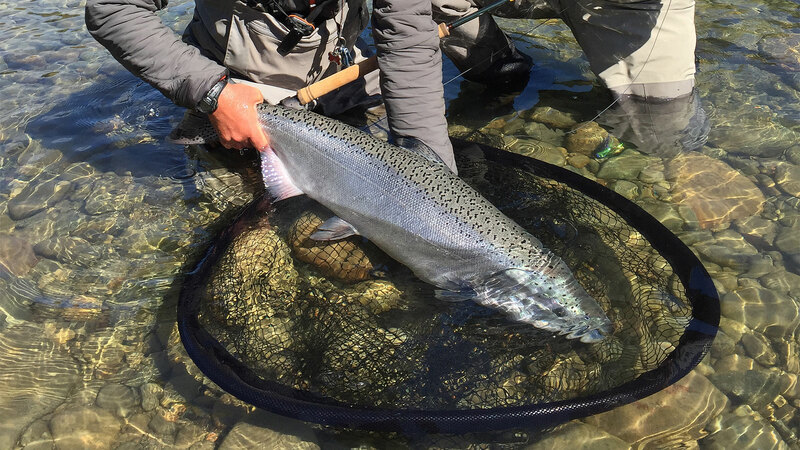 There is an astonishing king salmon fishery now available to the adventurous, traveling angler. Guarded by a maze of pristine fjords and spectacular, glacier-capped mountains in the heart of the Chilean coast — and boasting massive, chrome-plated Chinook — this river system is perhaps the most hyped destination to appear on the salmon atlas since the opening of the Russian Kola. 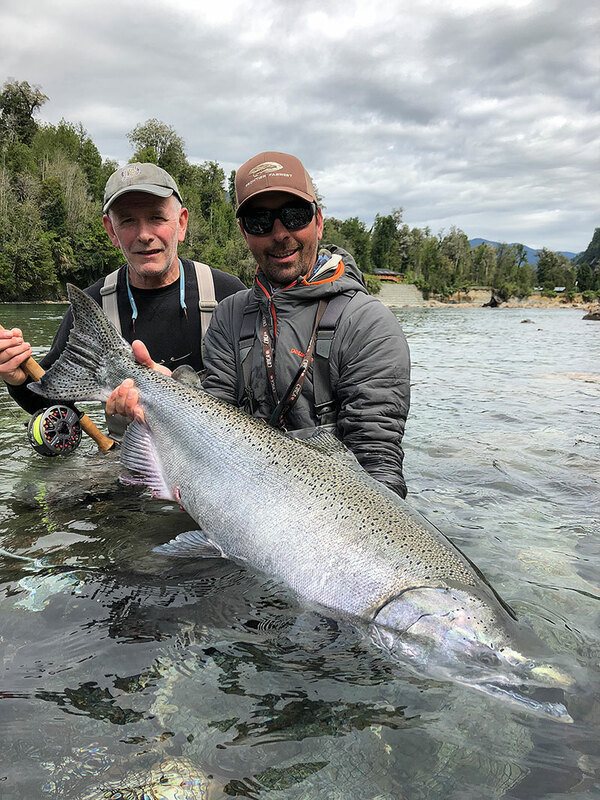 Salmon Junkies has secured a long-term contract with Austral River Lodge for the 2018 season (and beyond) to operate a fishing program on the most talked about Chinook river in Chilean Patagonia — a river with a significant run of wild-occurring, chrome-bright king salmon. Beginning this January and running through mid-March, we will share this emerging fishery with a limited number of rods. Since 2015, rumors of dime-bright, fly-caught 30- to 60-pound Chinook on a stunning river in a remote region of coastal southern Chile have echoed through the spey fishing community like siren songs. With phrases like “the perfect salmon river” or “the best Chinook fishing today” traded in hushed conversation, the destination has assumed the aura of a modern day salmon fishing paradise. Could the rumors and speculation actually be true? After an exploratory season and one full client season, the answer is a definitive — YES! With a legitimate chance to hook a bright salmon over 50 pounds on any day in any week of the season, this fishery is absolutely not a fantasy. But don’t take my word for it; see recent articles in Fly Fisherman, Fly Rod & Reel and Chasing Silver magazines for reference. 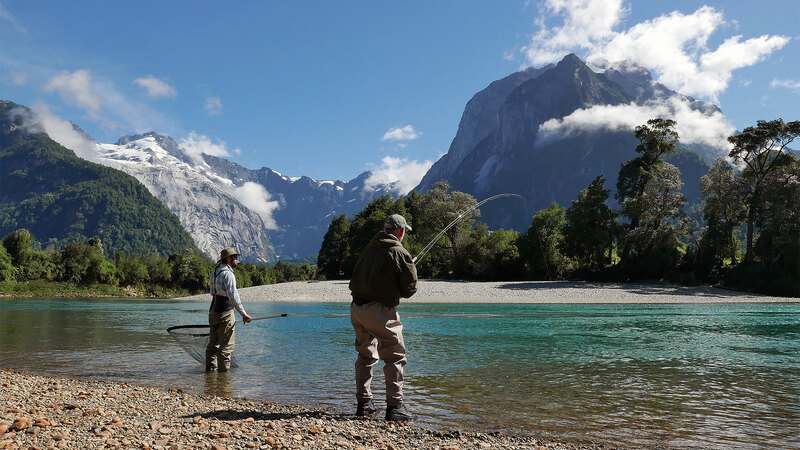 To bring this opportunity to you, Salmon Junkies has gone directly to the powers that be, and signed a long-term contract with the landowner and family of Austral River Lodge. Situated on the river’s tidal reach, this charming Chilean-style facility is positioned perfectly to take advantage of each tide’s bounty of kings. The fishing program — available to only fours rods per week in the capable, experienced hands of two of British Columbia’s premier Chinook guides — will focus on the river’s lower 30 kilometers, where primary resting and holding pools provide optimum water for targeting these magnificent salmon at their fresh-from-the-sea best. We invite you to join us at what we believe could truly be one of the world’s last great venues to swing flies for trophy salmon. But do come prepared. These very real and rugged Austral kings will test your angling skill, as well as every element of your tackle. It won’t be easy — such glories never are. But, yes, here you could very well reach the summit of your angling life. Indeed, we believe we are offering passage to a magical land — a place we call Valley of the Kings.